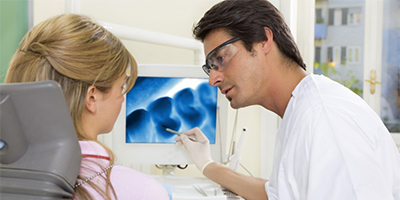 Digital radiography has become an integral part of modern dentistry. RVG - Digital Radiovisiography is the latest X-ray technology that utilizes ‘special image analysis software’ to produce high quality digital images directly on the computer screen. Exceptional clarity, timely interpretation, minimal radiation exposure and significantly precise diagnosis make this technology preferred over the traditional x-rays. There is absolutely no need for the time-consuming and cumbersome procedures of developing and processing of x-ray films. All you have to do is just relax in your dental chair and watch the images pop up on the screen while your dentist explains it! During the digital x-ray a small intraoral sensor is placed inside your mouth. When exposed to radiation it captures an image of your tooth and allows your dentist to show it to you on a computer monitor while you are in the dental chair. With just a single mouse click, your dentist can zoom in on a single tooth, rotate it, sharpen it and color it – all to explain your treatment procedure. The Digital x-ray sensors cannot be heat sterilized like other dental instruments and hence infection control can be a big challenge. Digital Radiovisiography is a valuable diagnostic tool that provides high-resolution x-ray images to ensure greater precision in treatment planning. The digital images can be also archived, retrieved for future reference or shared with other dental specialists for a second opinion. Dentists today are increasingly using digital Dental Radiovisiographs to better detect, diagnose, treat and monitor oral conditions and diseases. No more x-ray films, dark rooms, chemicals and processing procedures. You can now sit back and see your teeth and the surrounding structures come up on the screen right in front of you. It’s a blast to watch this system work! You will simply feel amazed!